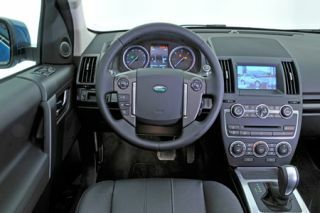 Meridian develops in-car audio systems for new Land Rover Freelander 2 | What Hi-Fi? British audio specialist Meridian has developed a pair of in-car audio systems for the new 2013 Land Rover Freelander 2, spending around 1500 hours fine-tuning them. Land Rover has given the 2013 model a major overhaul, with new colours, new exterior design features, new engines and upgraded equipment levels. That includes the option of two bespoke Meridian audio systems. The Meridian Sound System is a 380W, 12-channel stereo set-up with 11 speakers, including a dual-channel subwoofer. Alternatively, buyers can opt for the Meridian Surround Sound System, an 825W, 16-channel stereo and surround system with 17 speakers. Both systems employ the latest Digital Signal Processing (DSP) technologies to tailor the sound to the car's interior acoustics using Meridian cabin correction. In addition, Digital Dither Shaping enables "the most natural details of the music to become clear", the company claims. And the systems automatically compensate for extraneous noise within the cabin by means of Dynamic Volume Control. This is not the first in-car project Meridian has undertaken for Land Rover. It also designed the in-car audio systems for the Range Rover Evoque – read our extended review and watch the video here – and more recently it's had a hand in the refreshed Jaguar XJ executive model. Meridian will be even more involved in future Land Rover models, being consulted in packaging reviews to make sure the body-in-white attributes are suited to premium sound systems, reports our sister title Autocar.